Plunging a drain uses the forces of suction and compression. When you pull up on a plunger, it pulls water in the drain upward, beginning the process of loosening the clog. When you push down on the plunger, water is forced downward, moving the clog in the other direction. After a few up-and-down strokes, this push-pull effect breaks up and loosens the clog so the water in the drain can carry it down through the drain system (and out of your life). Keep the two forces in mind when plunging your drain. If it's your bathroom sink that's clogged, clearing it may be as simple as pulling out the pop-up stopper and cleaning it off. Hair, soap, and other gunk tend to collect on the stem below the stopper's plug as well as on the rod that moves the stopper up and down (the rod extends into the middle of the drain pipe). Use needle-nose pliers or a metal coat hanger bent into a hook to grab hair from these parts. If that doesn't clear the drain, then you'll need to move on to plunging. On bathrooms sinks, you must seal the drain pipe before plunging. 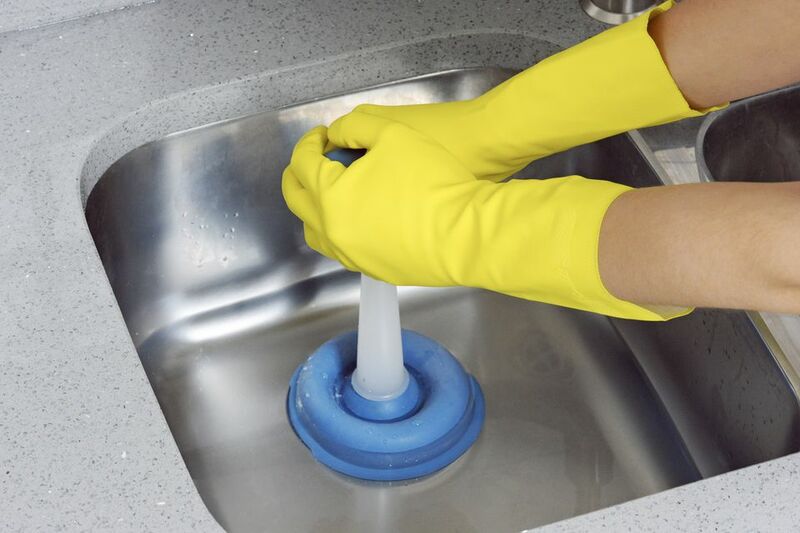 Use a wet rag to block the overflow opening, located near the top of the sink rim. It may be near the back of the sink or the front, and some sinks may have two overflow openings. Blocking the overflow opening will seal the drain so that the plunger can create the suction and compression necessary; without it, the plunging will have very little effect. On double-basin kitchen sinks, block the drain opening in one basin before plunging the other basin. Place the plunger cup over the drain opening so it covers the opening fully. Run a small amount of water in the sink—enough to cover the cup of the plunger. Thrust the plunger in an even up-and-down motion. The suction force of the upstroke is just as important as that of the downstroke. Maintain the seal between the rubber plunger cup and the sink surface throughout this action. You may actually be able to feel the moment when the clog loosens, as the plunger handle may suddenly get easier to pump. Tip: If you're having difficulty getting a good seal between the plunger cup and sink basin, apply some petroleum jelly around the lip of the cup to help seal it against the bottom of the sink. Pull the plunger away from the drain opening after about six pumps of the plunger, and see if the water drains away. If it does, you have successfully loosened the clog. If not, then repeat the process. Once the clog is freed, run hot water for several minutes to flush any debris down the drain. This can dissolve soap scum and help prevent new clogs from forming. If the drain isn't clear after several attempts at plunging, the next step is to snake the drain, a process that requires you to disassemble the drain trap. But in most cases, you will have cleared your clogged drain without even getting your hands dirty.